Superman is the first great superhero, the grandaddy of them all, so it’s therefore somewhat fitting that he’s found himself sung about in more pop tunes per capita than any other comic book character. (Batman, his rival for the hearts and minds of DC readers for the past 75 years, isn’t the sort of guy whose look and aura is conducive to anything that might be labeled a “ditty.”) His bright primary colors and his cheery, upright, best-parts-of-Americana Norman Rockwell image are ideal for obvious melodies and dulcet tones, so how could he not find himself pressed onto vinyl? Anyway, here’s a ranked list of songs about the Man of Steel. It’s by no means comprehensive, as there have been a metric ton that have alluded to the big guy over the years. To generate this list I’ve relied on two loose factors: how crucial Superman is to the song, and how deeply the song penetrated popular culture. It can be strong in one and weak in the other, or strong in both, which will factor into the ranking — plus any other intangibles that might come into the mix. (I’m making this up as I go along is what I’m trying to say.) I’ve thus come up with a top five, one that I think is fair and accurate. Or not. Whatever. Our first entry illustrates a song that’s tilted heavily to the big-time hit edge of the spectrum, while only slightly touching on the Last Son of Krypton. But if you were driving a car in 1998 and for a few years thereafter, you couldn’t keep the rock anthems of Matchbox 20 from blasting out of your stereo speakers. Their album Yourself or Someone Like You had a number of smashes on it, and no matter whether you liked their sound or not, none could deny their omnipresence. “Real World” has lead singer Rob Thomas pondering what it would be like to be a person with power. A rainmaker. A head honcho. And a superhero. And that superhero, while unnamed, is unmistakable, thanks to the yellow sun allusion quoted above. While this tune isn’t very much about the big guy, it deserves inclusion merely for the fact that it was played nonstop at the turn of the millennium — it makes the soundtrack of my college/post-grad years by default. And it has the virtue of associating Superman with “funky,” for perhaps the first and last time in the history of the world. Pondering Thomas having actual superpowers is a subject for another post. A terrifying post. Moving on. There’s a great deal of pathos inherent in Superman, a sadness that comes straight from his last-of-his-kind origin and how he’s a man who can do everything but can’t save everyone. It’s part of the reason I’ve always liked him more than his costumed cohorts — and these psychic reverberations are behind a chunk of art that hangs in my home. Uneasy lies the head that wears the crown, and heavy are the shoulders that wear the cape. In the early 2000s, Five for Fighting came out with “Superman,” a weepy ballad that dealt reasonably well with this, with lyrics that practically choked with Superman imagery: birds, planes, trains, etc. While you can easily find the song a bit mawkish (very easily), one of its early verses — I wish that I could cry, fall upon my knees, find a way to lie about a home I’ll never see — does make even the more jaded among us feel for the big guy. Being the greatest superhero of all leaves no room for self-pity, so we mere mortals have to feel it for him, and “Superman” reminds us of Kal-El’s emotional humanity. Like “Real World,” this tune was inescapable at its playlist peak. I recall a drive I made from DC to Boston to visit some friends in 2001, during which I think I heard it roughly 200 times. It must be the most commercially successful song about Superman ever — though it wasn’t the best of the weepy Superman oeuvre, as we’ll see in a moment. Man, the Spin Doctors were huge when the first burst on the scene. They disappeared pretty fast (their second album was a bit of a lead balloon), but they took off like a rocket. Their entry here is a double-barreled assault — not only did they craft a song about Superman, but the album it could be found on had a Superman-centric title culled from its lyrics: A Pocket Full of Kryptonite. “Jimmy Olsen’s Blues” came at the erstwhile Mr. Kent from a different angle than most, from the perspective of a lovesick Jimmy Olsen. He’s a mere mortal who just can’t compare to the might and heroism and do-goodery of the Man of Steel, and is left struggling to get the attention of Lois Lane, who’s of course agog over the spit-curled one. Any one of us who’s at some point been lovestruck for someone who has eyes for another can understand Jimmy’s plight here. Superman really is the starting quarterback/prom king/valedictorian archetype, whom you love and hate at the same time. Thanks to its jokey tone, this is the most lighthearted entry on the list, even though that pocket full of you-know-what has some deadly implications. Okay, this one ranks so high mainly because of the band that covered The Clique’s original tune. R.E.M. is by far my favorite band, so the fact that they once did a Man of Steel song is one of the more delicious examples of worlds colliding out there — “You got your chocolate in my peanut butter,” that sort of thing. So while this would have the lowest airplay ranking of any of these tunes — the track was even unlisted on its album, Life’s Rich Pageant — its intangibles are off the charts ( so to speak). This more than makes up for the song not really having much to do with its title subject, besides the allusion to x-ray vision quoted above. Like “Jimmy Olsen’s Blues” it has a lovesick theme, but this time from a Superman-esque POV. The song has the added bonus of being the first song in which bassist Mike Mills ever took the lead vocals reins, with frontman Michael Stipe handling the backup. This is manna for those of us who find “Half a World Away” and “Texarkana” to be two of the better tracks on Out of Time, in turn one of the band’s best efforts. Maybe this song should rank lower, but I’m letting my heart get in the way here. Forgive me. Extra Super Duper Bonus Trivia: The garbled speech in the beginning of “Superman” comes from a Japanese Godzilla pull-string doll. Worlds colliding even more! Our top song presaged Five for Fighting’s by a decade, and covered much of the same ground — but in a lower octave. The Crash Test Dummies had a lot of success in the early 1990s, cresting with their album God Shuffled His Feet, which got a lot of play on my Sony Discman back in the day. (It and Siamese Dream, along with the early Pearl Jam catalog, practically melted those circuits.) It was their prior, somewhat less heralded record, The Ghosts that Haunt Me, which had “Superman’s Song,” a slow, melodious elegy for the Man of Steel. It’s a nice, soft, easy to listen to tune, which does its hallowed subject justice. 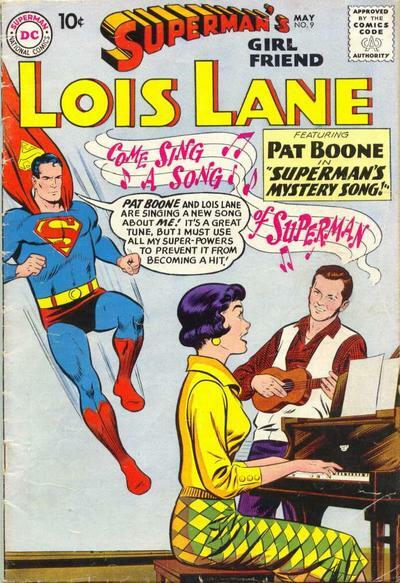 When the Death of Superman arc hit not long after this song made the rounds, it got a bit of a pickup, as suddenly people appreciated the hero who was gone from newsstands for the first time in a half-century, the guy they realized they had taken for granted all those years. The past tense was suddenly au courant, and the music video above, with costumed geezers mourning his loss, might as well have been scripted by DC. Lines like Folks said his family were all dead, the planet crumbled but Superman he forced himself to carry on reminded us once more of his sad origin and dogged protection of the innocent. And Even though he could have crashed through any bank in the United States, he had the strength but he would not recalled his forbearance, not technically a superpower, but perhaps the most crucial arrow Superman’s hero quiver. But yeah, the song might have been able to do without the repeated backhanded slaps to poor Tarzan. He’s smelly and stupid, we get it. Another bit of trivia: I seem to recall that one of the fake memorial magazines DC published after Superman’s death, which treated it as if it was real, had a fake quote from lead singer Brad Roberts, in which he explained how he made up the name “Solomon Grundy” because it rhymed with “money.” The reason was for this was because Grundy had been erased from continuity by the Crisis on Infinite Earths, and hadn’t been reintegrated into the Superman orbit at that point. So someone was paying attention when they put that fake mag together. Dazzle your friends with this utterly useless info! There you have it. Apologies to songs that didn’t make the list, and yes, I do realize that these selections betray a bias honed in the borderland between generations X and Y. But it’s my blog and I’ll rank what I want to. ← The Star Wars: The Force Awakens trailer will make you believe in metal lunchboxes!